I don't know how I haven't heard about this website sooner as it has been around for ten years! I heard about Cosme-de from a post on BeautyQueenUK's blog and I headed straight over to the site to have a browse and was really impressed with the brands that they stock. They stock brands such as; Nars, Benefit, Marc Jacobs, Etude House, GlamGlow, Tangle Teezer - to name a few! The website is every beauty bloggers dream stocking, Skincare, Make Up, Fragrances, Hair Care and more. 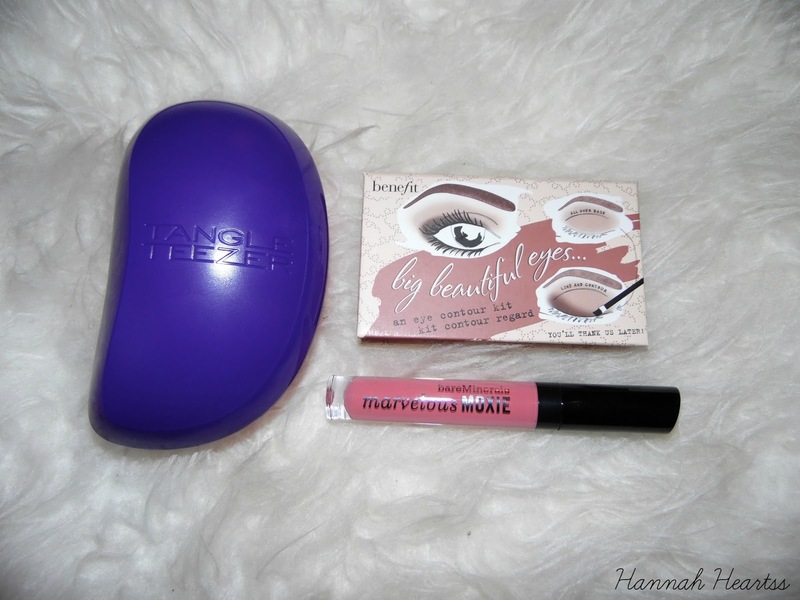 Everything is priced very fairly and some items are slightly cheaper than if you brought them in the UK which is what drew me to the website - who doesn't love cheaper beauty products? So when they got in touch and asked if I wanted to review a few things, I couldn't say no! 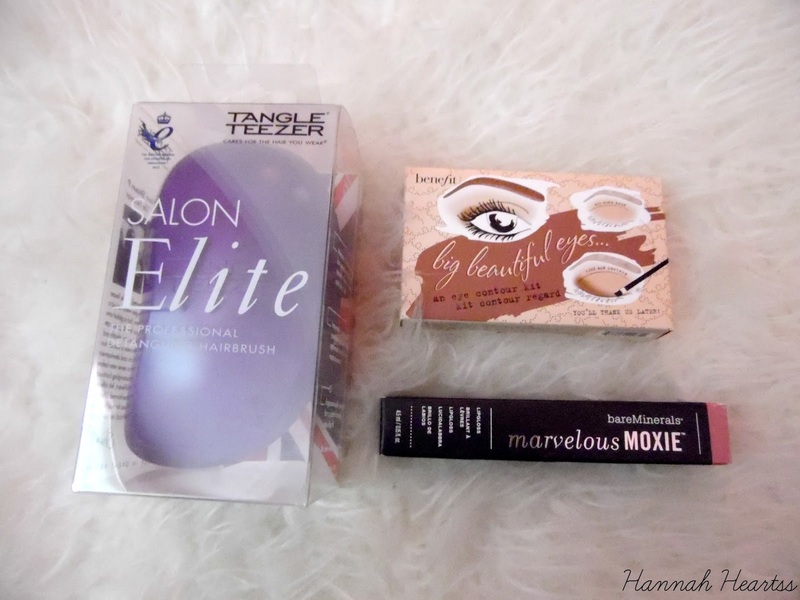 I spent hours browsing the website picking products and narrowed it down to these three beauties. The first thing I picked was a Tangle Teezer Salon Elite, I already have a Tangle Teezer but I have had it for so long that it needs to go to hair brush heaven. This one is perfect, it is actually bigger than my original one which I love. I picked the Purple Crush shade which is purple on the top and pink for the bristles. This brush is £11 on Cosme-de, whereas in most retailers they can be priced up to £15. BareMinerals is one of the brands I have always wanted to try something from but never knew what to pick - until I found this lipgloss. This is the Marvelous Moxie Lipgloss in Rebel which can only be described as the perfect everyday lip. This is priced at £12 on cosme-de but on the BareMinerals website it is £16 so quite a bit cheaper! And finally we have the product I am most excited about - the Benefit Big Beautiful Eyes palette. This is such a beauty. I have only recently got back into the habit of applying eyeshadow in the morning and at the moment I have been getting up at 5am for work so I needed a palette that I could use when I am half asleep and know I am going to look okay when I head out the door! This is priced at £27 which is about the same as it priced in the UK. Even with Cosme-de being based in Hong Kong, the package arrived within a week which I was really impressed with. It all came well packaged and nothing was damaged upon arrival. I would definitely recommend you go and check out this site if you are a beauty lover like me, you might even be able to find that product you have been after for slightly cheaper! If you do want to make an order, the lovely people over at Cosme-De and provided my readers with a discount code for 10% and free shipping! This code is valied until the end of September. You can use the code CDNEUK14. Have you heard of this website before? If you haven't, would you check it out now?